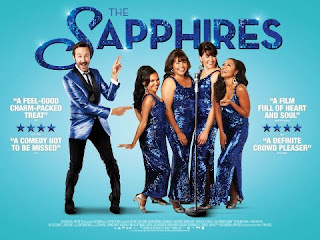 With 2006’s semi-enjoyable 'Dreamgirls' but a fleeting memory, the arrival of 'The Sapphires' is well-timed; bringing together a charismatic cast led by Chris O’Dowd as a down-at-heel talent scout who introduces four feisty Australian Aboriginal girls to bright lights, stardom and (most importantly) soul music. Against the vague backdrop of the 1960s and the Vietnam War, sisters Gail (Deborah Mailman), Julie (Jessica Mauboy) and Cynthia (Miranda Tapsell) tire of their humdrum village lives and dream of embarking on a glittering singing career. Fortune guides them to a meeting with Dave (O’Dowd), a shambolic scout who convinces them to ditch country ballads (amusingly described as "shite") in favour of soul standards. Along the way, the sisters reunite with estranged cousin Kay (Shari Sebbens) to complete the Sapphires line-up, and the group embarks on a tour of war-torn Vietnam to entertain the US troops. The treatment of the war itself is rather sanitised, cursory and lightweight, but then this isn’t supposed to be a hard-hitting movie – this is unapologetically feel-good entertainment, and the most enjoyable scenes are those in which Dave (O’Dowd is on top comic form here) and the girls trade quips and one-liners, bouncing off each other in a dynamic way that befits the film’s stage play origins. The musical numbers are another major highlight, giving Jessica Mauboy an opportunity to showcase her spectacular lead vocals on classic tracks that any self-respecting soul fan should know, like Linda Lyndell’s 'What A Man', 'I’ll Take You There' by the Staple Sisters, and of course the immortal 'I Heard It Through The Grapevine'. Though the more serious, historically contextual subject matter – such as the brutality of the war and Australia’s endemic racism – are handled with a certain amount of levity that some may find irritating, there are moments of genuine emotion that keep you connected to the story and help to stave off the subtle waft of cheese that pervades throughout. Cheesy though it may be in places, 'The Sapphires' is charming and buoyant enough to carry it off, with a real sense of fun and heart. 'The Sapphires' premiered in the UK at the London Film Festival 2012. It is out in UK cinemas tomorrow, through entertainmentone.